This wonderful product is great for any store going for that sleek, modern look. 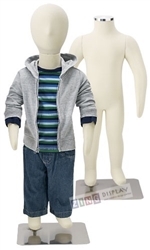 This Child Mannequin is a great for any store trying to modernize their child lines. This mannequin is pinable and bendable.